Seniors in the Mock Trial program had a dress rehearal Tuesday at the Gallia County Counthourse. GALLIPOLIS — River Valley Mock Trial students are getting ready for competition. 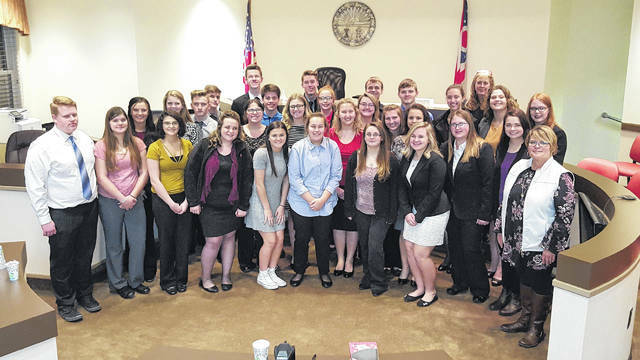 Juniors and seniors from River Valley met in the Gallia County Courthouse Tuesday evening to rehearse for the upcoming trial. The Mock Trial program is a part of the Advanced Placement (AP) English curriculum and involves numerous aspects that are related. According to Aaron Walker, advisor for the program, Mock Trial involves students learning to debate, speak publicly, perform, how to act in a courtroom, and a large amount of information about the legal system. Local judges and attorneys help the program, including City Solicitor for Gallipolis Adam Salisbury, Judges Margaret Evans, Dean Evans, and Eric Mulford. Salisbury is the legal advisor for the program, helping teach the students how the court system works and its specific proceedings. Several judges have allowed the students to observe real cases and speak with them about the court system. Currently RVHS Mock Trial has 55 students, who will compete in teams of about ten in a mock trial court case and judged on their execution of their roles. Different students will take on the part of attorneys, defendants, witnesses, and others to play out their mock trial. The students run the trial and must follow the prescribed order of a court trial – opening statements, direct questioning, cross examination, objections, and closing statements. The five RV teams will split into two groups on Friday to compete at two locations; three teams going to Portsmouth and two will travel north to Marietta. Walker explained the benefits of mock trial as rigorous and involved several disciplines. The program was started at RVHS in 1998 by Graham. Over the years it has progressed and fits into the AP curriculum at River Valley, and has become a model for other Mock Trial programs in the state. The Ohio Center for Law Related Education chose River Valley to display how schools are using Mock Trial in the classroom as a part of the curriculum.